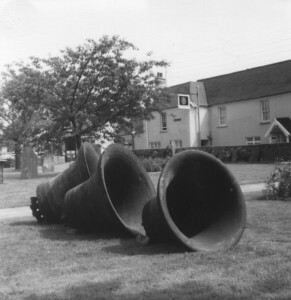 Refurbished Bells at St Mary’s. 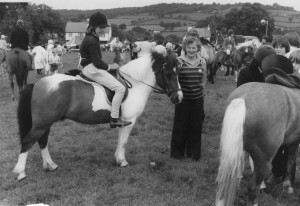 A scene at a Hemyock Gymkhana in the early 1980s. Pictured is the Hon.Sec and Treasurer of the Gymkhana, Mrs Phyll Kallaway (The mounted young lady is a Miss Wyatt). Phyll is one of Hemyock’s leading lights when it comes to organising fund raising events. The Gymkhana, over the years, has raised money for a wide range of causes including Jimmy Savilles Stoke Mandeville Appeal Fund. Celebration of 100 years of the Milk Factory. 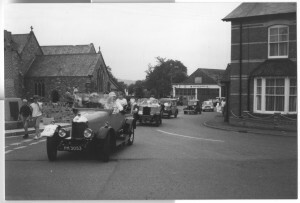 A parade of vintage vehicles passing Hemyock motor and the church during the celebrations to mark the Centenary of the Milk Factory 1986. 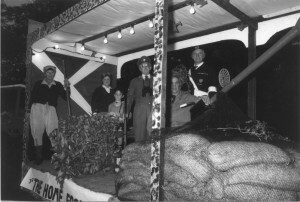 Carnival Float 1989, L to R. Barbara Churchill, Barbara Bowden, Les Bowden as a young evacuee, Jim Hawkins and John Churchill. 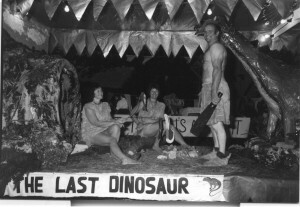 Carnival 1988. 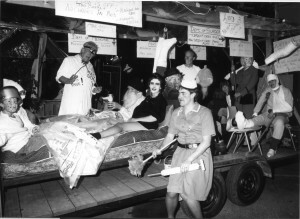 Hemyock Surgery’s Float, Dr. John Griffin in a white coat preparing to operate, Dr. Jonathan Meads in an outsize nappy, Dr. Donald McLintock dressed as a very fetching Staff nurse, holding a giant hypodermic syringe, with a number of patients and Mrs. Christine Meads disguised as Mrs. Thatcher looking on. 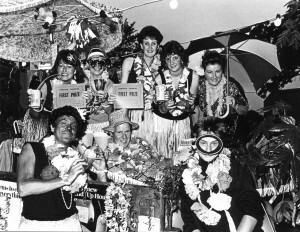 1st Prize in the 1987 Carnival, L to R Back row – Doreen Moores, Hilary Cole, Debbie Scoble, Sarah Scoble, Rita Hooper. Front row – Steve Moores, Derrick Parsons (driving tractor), and Spencer Moores. A group at Redwood coach depot around 1988. 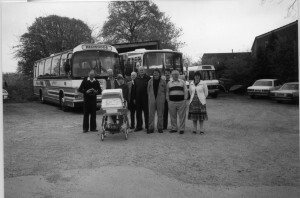 A group at Redwood’s coach depot c. 1988. L to R. Brian, Paul and Jackie Redwood with pram and Geoffrey Sutton, Charlie Burston, Paul Cross, late Terry Smith from Tonedale, and Ann Redwood. Early 1980s. 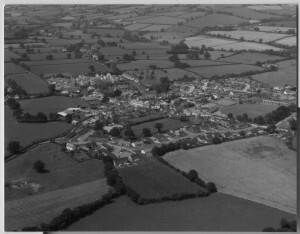 Aerial View of Hemyock from the S.E. with Churchills and Prowses in the foreground. Higher Mead, East Mead, Redwoods Close and Culm Meadows have yet to be built.